MedNous was founded in 2007 by the international journalists Victoria English and William Ellington in response to the need for an independent European publication about the commercialisation of new medicines. The MedNous journal and website are produced by a staff of experienced writers and editors with the support of an eight-member Editorial Board. Members of the Board are experts in the biological sciences, business development, regulation and intellectual property. The Board contributes actively to the journal by recommending topics for review and writing occasional commentaries. William Ellington, the executive editor, is a veteran financial journalist having worked for the International Herald Tribune in Paris and the Dow Jones News Service in Brussels, Geneva and London. He is a former columnist for The Wall Street Journal and former publisher of a newsletter on the international bond markets. He is also a former director of IFR Publishing, a subsidiary of the Thomson Organisation, where he developed a screen-based information service for the international swap market. Victoria English, the editor, is a former financial journalist for Dow Jones and Reuters having worked in New York, Amsterdam, Brussels and London. In 1997 she began writing about healthcare at Reuters, and later joined Scrip to cover the pharmaceutical industry. From Scrip, she became editor of the Regulatory Affairs Journals specialising in pharmaceutical and medical device regulation. Victoria is the 2002 recipient of the UK Medical Journalists Association award for excellence in medical journalism. 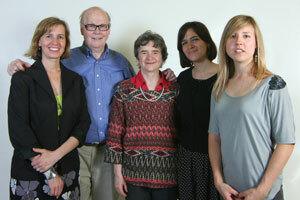 Besides William (second from left) and Victoria (centre), the MedNous editorial team includes. Karen Finn (left), Lucy Sorell (second from right) and Jo Caird (right). Oscar Rickett (marketing) and Melissa Sterry (art director) were not present for the photo. Please see the tab ‘Editorial Board’ under ‘About MedNous’ for information about the Editorial Board.